To capitalize on momentum in our neighborhood, the Bloomfield-Garfield Corporation provided the impetus for “Garfield 2030,” an ambitious master plan to make Garfield a neighborhood of choice for residents and businesses. Garfield 2030 arose out of community meetings held in 2009. 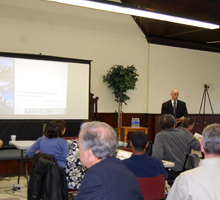 The final plan was presented to the community on April 29, 2010. Consultants Perkins Eastman took Garfield 2030 from theory to practice by breaking the 2030 goals into manageable steps. The result is a final Neighborhood Investment Strategy. Develop a Garfield Vacant Lot “Handbook” of improvements that private owners and organizations can make.